This lovely Christmas cottage evokes memories of romantic times spent with each other during the holidays, and couldn't be more suited to celebrate a special couple's first Christmas with each other. Personalize the front with the couple's names and the year or a date, and the reverse side with your custom message. 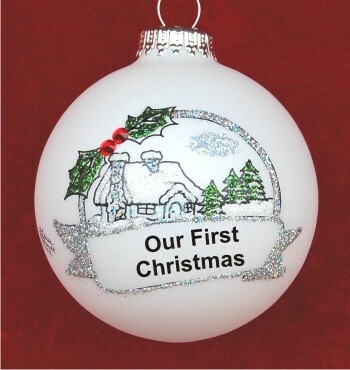 The Cozy Christmas Cottage Our First Christmas Together personalized ornament measures 4"D and arrives in its own custom box. From Hubby Nov 8, 2014 Eleanora W.